Do you ever get exhausted, thinking of everything that needs to be done? I do. …hmm, I wonder what’s on Netflix? I’ve tried to tame it over the years, to gain some sort of mastery over all the “stuff”. First, I used ridiculously overcomplicated “to-do” list software that looked like gantt charts, but that was just overwhelming. Then I tried out Google’s “Tasks” but they were too simple and impossible to organize. For the last couple years, I’ve been using Trello, a kanban-style product that’s simple to use but I don’t think I’m using it to its full potential. In every case, my need-to-do’s, want-to-do’s and might-do-someday’s all end up as “amorphous blobs of undoability” (one of my favorite phrases from the GTD book). With all that in mind, I’ve finally started reading Getting Things Done by David Allen, something else I’ve intended to do for some time but never got around to. I think a lot of us feel like the edges have blurred when it comes to work, and that sometimes there’s no clear definition of “done”. As a programmer, I know there are hundreds of languages and frameworks and libraries and combinations of each of them to the nth degree. You want to do something? There’s probably a dozen ways to do it, and pressure to understand when and why. But we only have so much time for so many things, including a lot more than work, and we have to learn to define our own edges. In the old days, work was self-evident. Fields were to be plowed, machines tooled, … widgets cranked. You knew what work had to be done – you could see it. It was clear when the work was finished, or not finished. Have you ever had a project you pushed off because you had a vague idea it’d be really difficult? Then when you finally do it, you wonder why you didn’t deal with it weeks or even months ago? I definitely have. There are things that my brain won’t let go of, that keep gnawing at the edge of my thoughts although I believe I’m not ready to deal with them yet. But when I finally do, I’m relieved. And it’s usually nowhere near as difficult as I’d made it out in my mind to be. You have to think about your stuff more than you realize but not as much as you’re afraid you might. In knowledge work . . . the task is not given, it has to be determined. Most people have a resistance to initiating the burst of energy it will take to clarify the real meaning, for them, of something they have let into their world, and to decide what they need to do about it. There’s not a whole lot we can truly manage about our environment, but we can control what we do with the time and information we have – our “next actions” as David calls them. The key to managing all of your “stuff” is managing your actions. What you do with your time, what you do with information, and what you do with your body and your focus relative to your priorities – those are the real options to which you must allocate your limited resources. The real issue is how to make appropriate choices about what to do at any point in time. . . how we manage actions. I have found that lack of time is not the major issue . . . the real problem is a lack of clarity and definition about what a project really is, and what the associated next-actions steps required are. “Open loops” are those things you need or want or dream about doing that you haven’t written down yet. It’s all floating around in your head and, just like the mental grocery list you only remember when you open the empty fridge (as opposed to when you passed the grocery store on the way home from work), these things will come to the forefront of your mind at the least opportune time. The challenge is to get them into a system you’ll trust and have available to check at the right time. Any “non-actionable” items get written down to, but in a “someday” list or “parking lot”. There’s also a system David briefly mentions called the “tickler system”, which I suppose he’ll elaborate on in part 2. Apparently, you setup reminders for revisiting non-actionable items again in the future so they don’t go forgotten. Frequent reviews of everything you’ve written down prevent a big stale mess (which is usually what I end up with). Besides, what was a low priority one week may be top priority another week. This is so true. When I’m programming, I frequently walk among the trees, push through some shrubbery and once again find myself crawling around in the ground cover getting all tangled up in the vines. Pretty soon I can’t remember why I was even in this particular forest and what I was trying to accomplish. It never hurts to ask the “why?” question. … Why are you going to your next meeting? What’s the purpose of your task? Why do you have a budget? It’s so easy for us to create things, get caught up in the form of what we’ve created, and let our connection with our real and primary interactions slip. Is your purpose clear and specific enough? If you don’t really know when you’ve met your purpose or when you’re off track, you don’t have a viable directive. The question “How will I know when this is off-purpose?” must have a clear answer. This just totally reminded me of a pensieve, lol. I’m such a nerd. The great thing about external brainstorming is that in addition to capturing your original ideas, it can help generate many new ones that might not have occurred to you if you didn’t have a mechanism to hold your thoughts and continually reflect them back to you. Psychologists are beginning to label this … “distributed cognition”. After generating all these ideas, you have to look for patterns to organize into next actions… even if the next action is just to brainstorm more ideas. 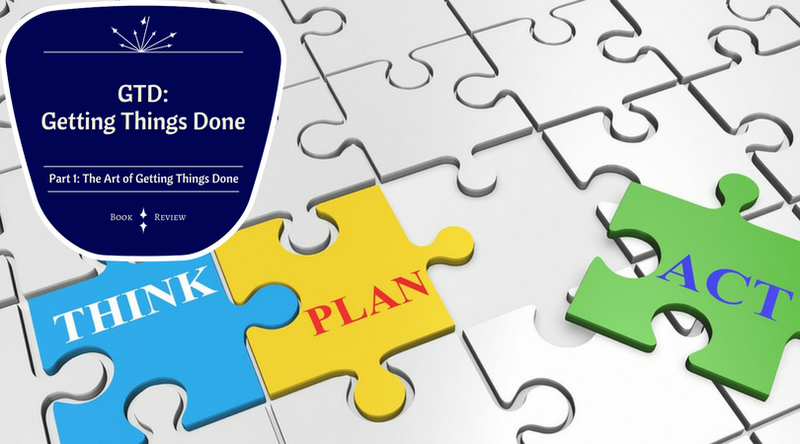 How much planning do you really need to do? As much as you need to get the project off your mind. The reason things are on your mind is that the outcome and the action step(s) have not been appropriate defined, and/or reminders of them have not been put in places where you can be trusted to look for them appropriately. It’s not a one-way street either. Sometimes you’re in the weeds and need to back up to look at the bigger picture. And sometimes you’re stuck in the clouds and need to dig into the details more. If greater clarity is what you need, shift your thinking up the natural planning scale. People are often very busy (action) but nonetheless experience confusion and a lack of clear direction. If more action is what’s needed, you need to move down the model. There may be enthusiasm about the purpose of a project but at the same time some resistance to actually fleshing out what fulfilling it in the real world might look like. I’m looking forward to learning more about how to get things done. A lot of it is common sense once you read it, but that doesn’t mean we’re born to think that way. Sometimes it takes someone phrasing something in a new way or putting it in a new light, so the rest of us can learn to do it right.